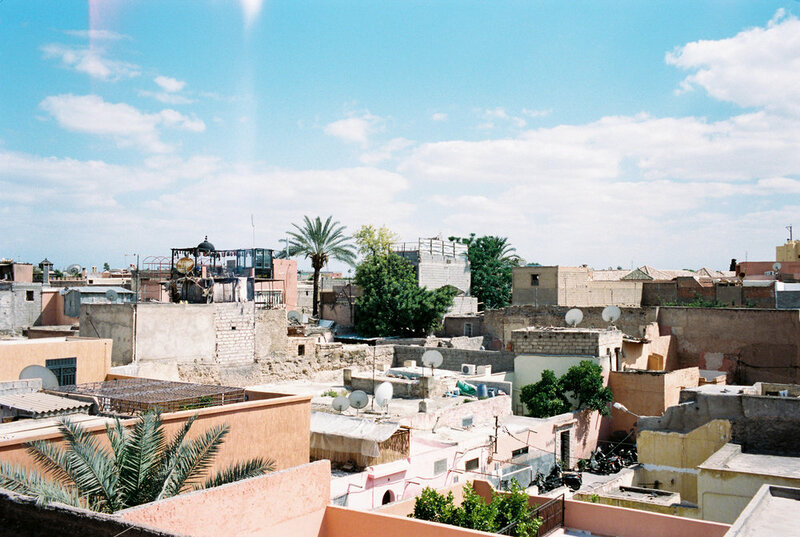 Marrakech – For a long time I would like to visit the red city. Because of its dreamlike oriental surroundings and rustic beauty. It’s easily one of the most beautiful and fascinating cities with all of its colorful places. 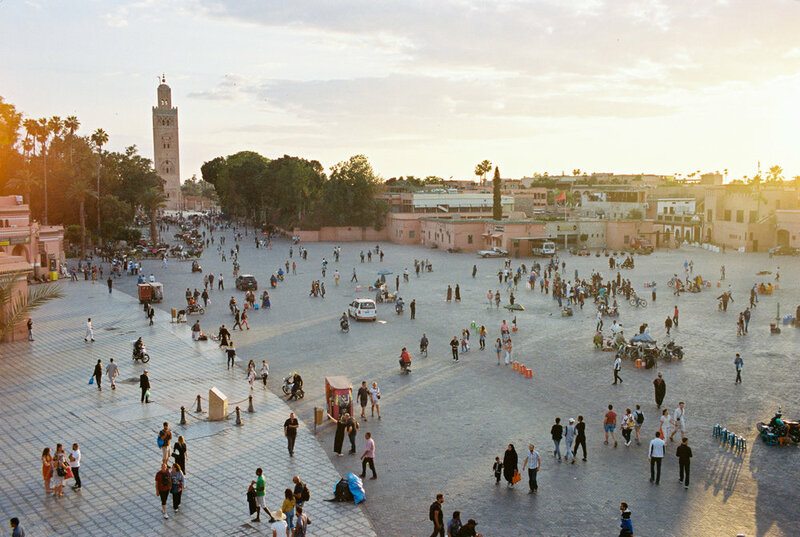 A trip to Northern Africa is not complete without checking out Marrakech. This more than 1000-year-old city is home to a thriving medina, amazing shopping, and some of the most gorgeous architecture you won’t find anywhere in the world. Finally we made it. It’s just 2 hour flight from Gran Canaria, where we are living. And with the airline-company Binter Canarias we could fly to Marrakesh quite economically. So finally we managed it to visit Marrakech and I can say it was so worth it! We arrived Marrakech at noon and a cab driver from our Riad, who was waiting at the airport, brought us to the Riad. We stayed in the Riad Zahir, which we booked for three nights. It’s not easy to find but it’s worth the search. Located in the center of the Médina, 12 minutes from the Jemàa El Fna Square. 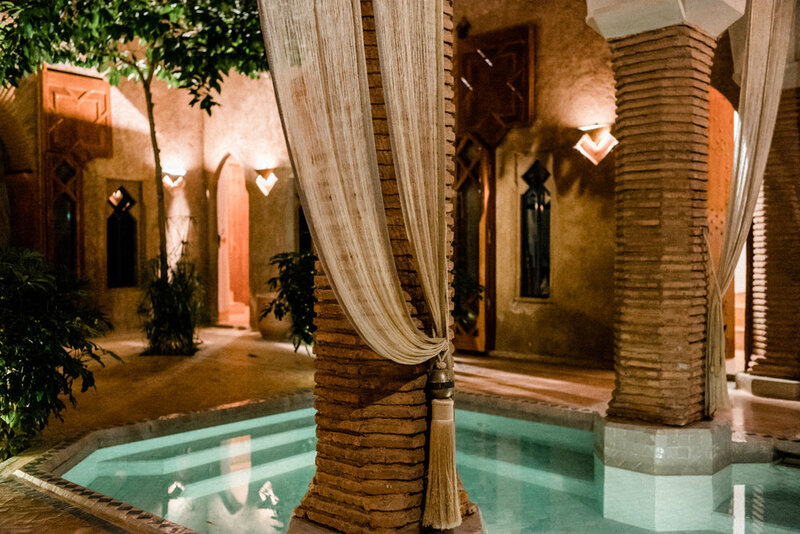 The Riad is such a beautiful and calm place, inspired by the Berber architecture from the south of Morocco. Just a street away from the madness of the city. From outside you have no idea what beauty will hide inside when entering the door. 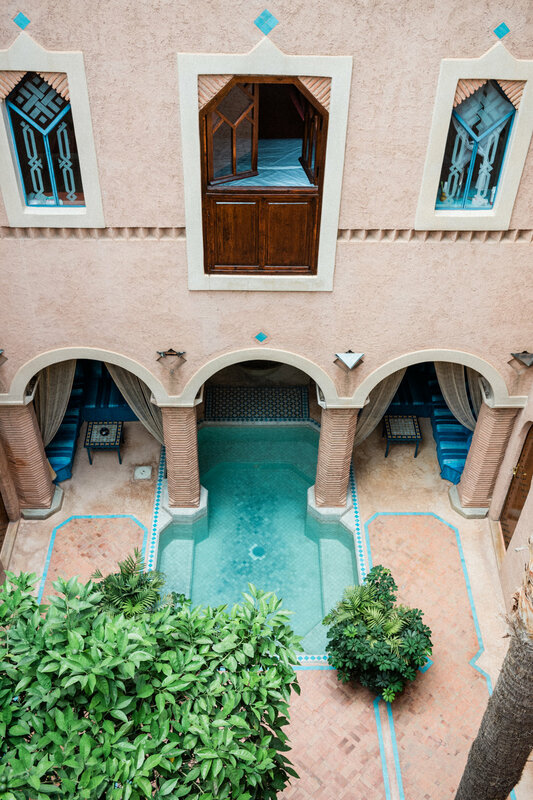 You are outside on the vibrant streets of Marrakech and you open the door of the Riad to find the most beautiful and relaxed oasis. After we checked in and we enjoyed a moroccan welcome drink of fresh mint tea and honey nut biscuits at the pool area, we moved in our cozy room. All the rooms were built around a cute mosaic pool. 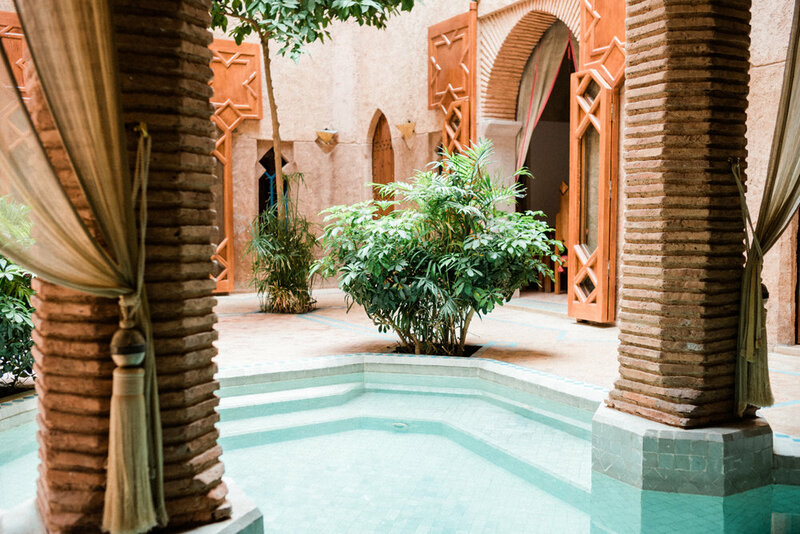 Morocco is a Muslim country and so you’ll quickly notice some cultural differences, which is totally ok. That’s why, I’d packed lightweight, loose fitting clothes that covers my shoulders and knees (like maxi skirts, long dresses and scarves). After I changed my airplane-outfit ( jogger, shirt and hoody) into a maxi dress with a white scarf over the shoulder, I was so exited to discover the red city, as they call Marrakech also. I added my sisal bag and because it was super hot, I couldn’t wear some solid shoes. That’s why I chose my flip flops (be careful, you will get dirty feet). 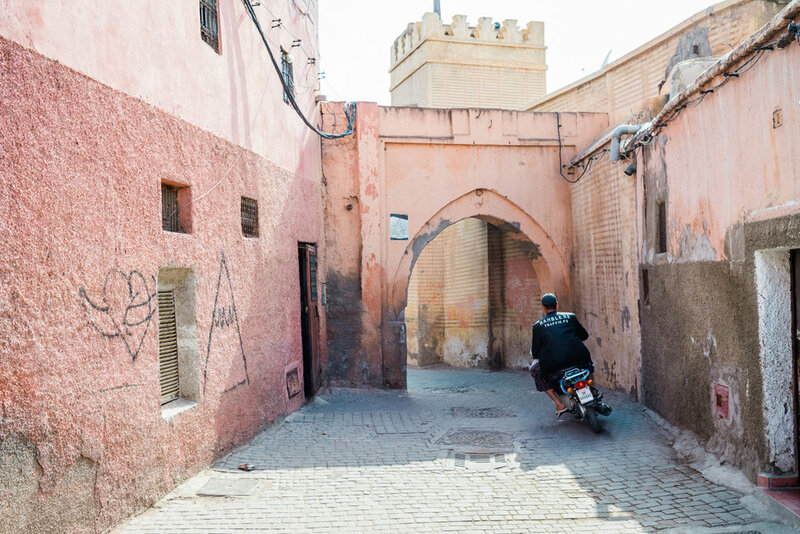 You simply cannot visit Marrakech without getting lost in the pinkish corners of Marrakech and especially the old town Medina. There was so much to discover! That’s why I would like to share with you all the places I truly love and recommend after visiting Marrakech. It’s pretty easy to get around the Medina, the old city of Marrakech, by foot. We mostly walked, but I recommend having a map or using a phone with data to use Google maps as some of the directions can be tricky! You can also download offline maps in advance if you know where you will be headed. So let the pictures speak for themselves. First we checked out the main street with the direction to the “Koutoubia Mosque”. It’s one of the oldest, biggest and most important mosque in the city. No visit to Marrakech is complete without a visit to the beautiful Koutoubia Mosque. Unfortunately we couldn’t go inside. Because for tourists isn’t allowed to enter the mosque, even because it was Ramadan in this time. But the minaret of the mosque will help us a few more times to orient us in this maze of streets. In front of the mosque I had my first experience with the way of selling in the streets of Marrakech. One guy came to me with a full tray of fresh and wonderful smelling biscuits. He asked me “Hello Madam, where you come from?” I answered him and that’s it, I was in the trap. He spoke with me a few words in german and without asking he put one of the biscuits in my hand and said ” for free”. Then he continued telling some something, I listened to him with big interest because it seems to be a really nice guy. Daniell already checked out that there is something wrong and he already waited in safe distance.When I tried to leave this guy, he opened his hand and asked for the missing money of the biscuit. And maybe, he was able to buy a good meal for his family. The souks is northafricans biggest bazar/market. A lot of small streets full of jewelry, kaftans, lanterns and carpets, dates and figs, perfumes and tea. 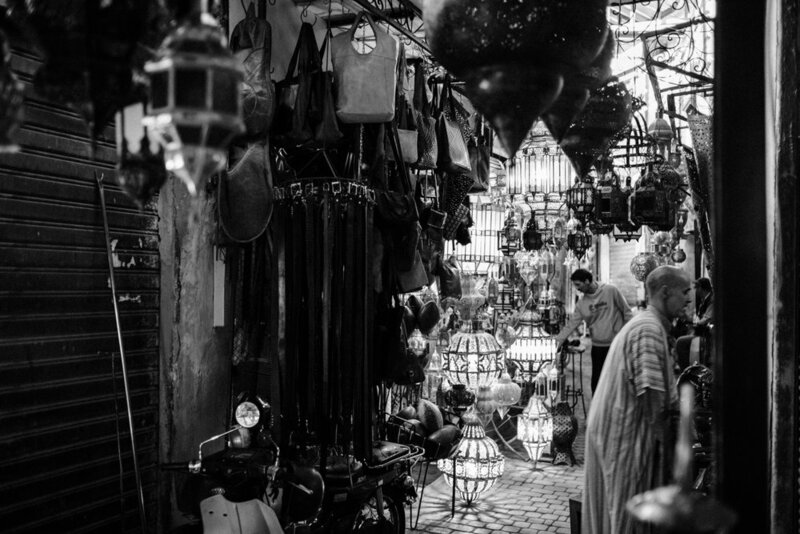 From iron-workers, to leather-makers, farmers to apothecaries, a lot of vendors have established their workshops in the back-streets of Marrakech, making the souks one of the most vibrant and animated places in the world. I’m obsessed with Moroccan style. There are so many incredible handcrafted goods here. I loved looking at all the carpets, spices and cute lamps, if it’s possible to check out all the stuff without being besieged by all the sellers. At the evening we where pretty overwhelmed from the amazing hustle and bustle in the souks. Maybe it was one hour before sunset, so we decided to check out the Jamaa el Fna – Main square. This square is absolutely amazing as well as crazy. People are going to try to make you buy things and make you pay for taking photos of them. They might put snakes, monkeys and everything else on your shoulders. Or they tried to enforce you to make henna tattoos. Around sunset, at 6:30, no opera box seat is as coveted as a plastic chair at the roof tops of the Cafes at the Jamaa el Fna – square. It may be a tourist trap, but this is the best seat to observe the nightly carnival of the Jamaa el Fna. From their we watched the hectic event quite relaxed while enjoying a mint tea. After the wonderful craziness we decided to go for dinner. And our first restaurant was one of the most popular restaurants in the Medina called “Nomad”. We didn’t reserve a table, so unfortunately we had to sit inside. The rooftop is an oasis above the medina and you will be rewarded with a calm and tranquil spot to enjoy a good meal. The Nomad has perhaps one of the finest examples of a modern Moroccan menu in Marrakesh at the moment and should not be missed while on your foodie adventure of the red city. They are using fresh local produce and spice to create twists on traditional recipes. After this culinary delight we went through the souks back to our Riad and we recognized that at 09:00 pm is probably the best time to check out the entire offer and curiosities. Because it’s quite calm in the souks. That’s why we discovered a wonderful lanterns store, where we bought a big colorful lantern, which is now hanging outside at the entrance of our home. Proud that we were able to bargain down half of the price. Although, they recommend, that you should bargain down 1/3 the price. Ok, ok we were still practicing! After this vibrant day, we were quite tired, but surprised by a marvelous illuminated surrounding in our Riad, we decided to stay in the patio to enjoy the peace and calmness and have a good talk with the host of the Riad. Happy and tired we just took a urgently desired shower. Then we fell directly into bed and a few minutes later also in a restful sleep. Until in the middle of the night the singer of the mosque next to our riad called the people to pray. Luckily we had our ear plugs with us, which we will use every night. Wondering what the next day will bring, we fell asleep again. I hope you could capture a little bit of what we have experienced on the first day and you will stay curious about the second day. In this sense, stay tuned!